Wadi Rum, Jordan I rarely get the chance to photograph myself, but when I do I don’t do the typical one armed pointing the camera at my face with something in the background thing, for me that’s too contrived. The thing I like most about my photos is that they are shot just the way I see them, and express exactly what it was like to be there. Because of that every scene is an extension of myself and my experiences. Because of that the need to plop my face in front of the camera to express where I’ve been is moot. However I wanted to express that after a long day wandering in the desert, I just plopped myself down and watched the camels graze. The two front legs of the animal are hobbled just like what’s depicted on the petroglyphs I posted yesterday. This ancient practice keeps them from galloping off into the sunset, and instead they graze on the sparse but nutritious grasses popping out of the sand without straying too far from “home”. Including my feet was the perfect way to express this unusual relaxation scene that I found myself in. Photographic details: I used a higher aperture of f9 to keep things sharper, but not too sharp so the image will lose depth. Using a wide angle lens at 35mm helped to easily keep my legs in the shot. I just laid back in the soft sand, got comfortable and snapped a few shots while the camel was chewing his cud. I would have preferred the camel move a little to the left but I think that was asking too much of him on his down time. Normally I could have moved to the right to get the camel in the right position but I would end up falling off the sand dune. Wadi Rum, Jordan Written by the pre islamic people of the arabian desert and sinai areas, some of these Petroglyphs are up to 2400 years old. These "photographs of ancient times" even depict wildlife that are either extinct or do not live in the area, as over time the local climate has since changed to a more arid one. This area being famous for Lawrence of Arabia and the filming of "red planet" I can't help but think the deep history of this place is often overlooked. This is where people have lived and thrived for thousands of years, whole lifetimes written out like a story book for us to see so many years later. I feel almost like I can touch the rock and go back and time and ask these people, "What are your hopes and dreams?". 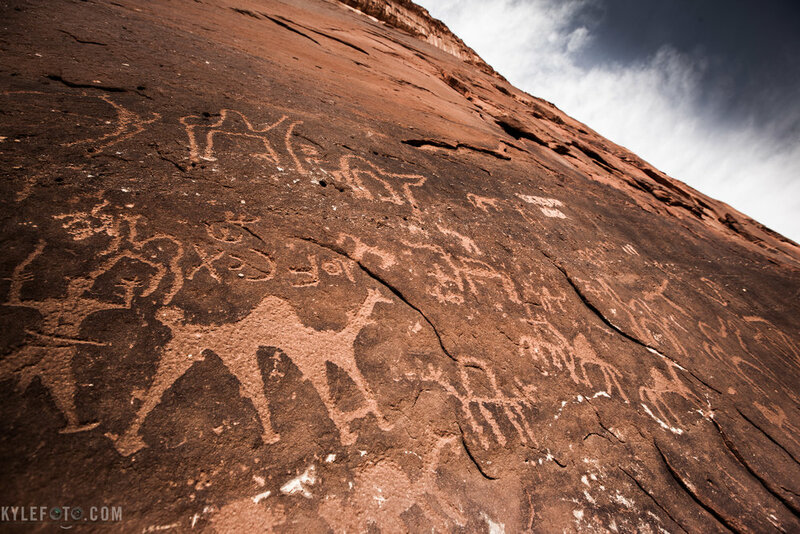 The largest petroglyph of the camel on the bottom left shows a hobbled camel, the practice of tying the front two legs together so the animal can't run far. This allows them to slowly graze without ever needing fences and is still done by the people who live here today. Photographic Details: Using a polariser I was able to darken down the blue sky into a much deeper blue. The clouds seem to erupt from the cliffside pronouncing the deep history of these images. I didn't keep the aperture too sharp as I wanted some of the wall to blur into the distance, farther away objects fade from view just like the passage of time obscures our view of the past. Wadi Rum, Jordan I had the afternoon to myself to explore the area surrounding my camp. My guide told me there was some fun climbing in the cliffs and rocks overlooking us, he sure wasn’t kidding. The inner child in me came out to play on the fantastic formations of granite and sandstone, every curve, cave and crack was a gateway to new worlds and fantastic views. Photographic Details: This is another great example of framing. When I’m out and about I search for something (usually trees) to use a real world object to frame a scene or subject. In the case of the desert it’s the rocks themselves. Not only does this frame show us what the rocks looks like up close, but you can see the very cliffs they make in the distance; It’s a two in one shot. In addition the multiple angular lines made up of the rock is pleasurable for the human eye, providing many paths for the eye to follow, like a visual roller coaster guiding your view over every stone and texture in the image. 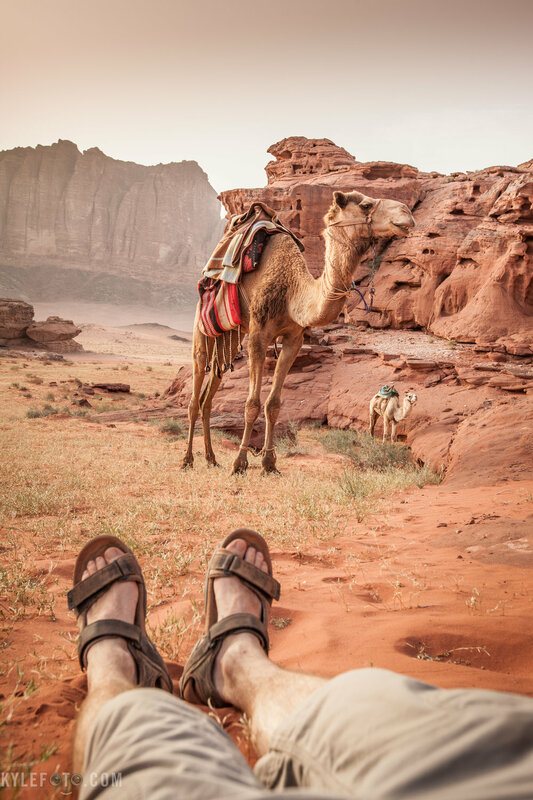 Wadi Rum Desert, Jordan The warm unmoving desert air was stifling, a day riding these four legged beasts felt like riding an oven with square wheels. Never the less I enjoyed it! Spending the day wandering across the desert free of the sound of any vehicles, journeying our way to a place where there is shade and water before the heat of the high noon sun arrives. It was actually slightly overcast, the thin clouds above acting like a giant blanket keeping all the heat of the day in, instead of letting it escape into space. Photographic Details: These camels had a lot of attitude but of course by now we were used to each other. This guy was laying down and in the clean soft sand it was easy enough and really comfortable to lay down as well. I wanted to get a unique perspective, this is a classic example of a photographer either getting as low or high as possible but not at eye level. Because of his incessant chewing of cud his jaw looked unusually blurred, I had to use a shutter speed of 1/250th of a second to freeze that motion.